Some garden shrubs are extremely valuable in providing a varied diet for parrots. First and foremost amongst these are the Pyracanthas, commonly known as Firethorn or Evergreen Hawthorn. These plants are evergreen shrubs which in their natural habitat extend from south eastern Europe to Northern India, and China. The flowers are inconspicuous in the spring, but the plants become absolutely packed with the most colourful berries - yellow, red and orange. As the name implies the plants have a very sharp strong thorn, so they need to be placed where they are not easily bumped. The parrots do not mind the thorns and when they have eaten the berries, they then commence to chew away at the leaves and the bark, altogether a feast. In the garden the native finches delight to build their nests in these shrubs where they are safe and secure from the depredations of cats. 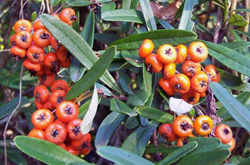 There are about seven species in the genus Pyracantha and two of them are especially valuable for aviculturists because of the time of ripening. Pyracantha coccinea comes from the Himalayas, and the best one is lalandei which is the first of all to ripen. I can usually start picking berries from this one about the end of January to early February. It is a tall fast growing shrub about eight feet high and six feet wide with orange berries, which, incidentally will last well on the plant for a couple of months after ripening. The last to ripen, usually about June, is P. augustifolia from southwest China, and is a real beauty. The berries are large orange coloured, and will hang on the bush until spring. This shrub is more spreading and a little slower growing than lalandei, and would eventually get to about ten feet high and eight feet wide. All Pyracanthas are good bird food, and if you want one with red berries then get P. coccinea crenulata, but the berries here fall quite quickly, and must be used as soon as ripe. Any one at all is good, but the ones mentioned cover the longest period of picking for you. They grow well in all climates except tropical. 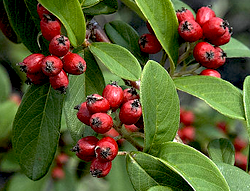 Cotoneasters come from Europe, north Africa and southeast Asia, but these berries are not as sweet as the Pyracanthas and they have only one seed, whereas the Pyracanthas have about six. The best one for berries is Cotoneaster serotina, and the silver-eyes in the garden enjoy these berries immensely. They ripen about June. Some roses, mostly the single types, produce fruiting pods which are called "hips", and the parrots love these as well. The best that I have found is a native species from China, Japan and Formosa. 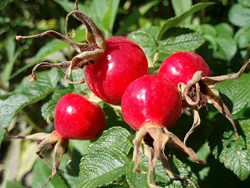 They are known as Rosa Rugosa roses, and all those having single flowers and produce a heavy crop of hips which are soft and fleshy and absolutely packed with seeds which one presumes must be very good nutritionally for the birds. These ripen from about November or December. It is to me a source of great pleasure to fill up the trays in my aviaries with these colourful fruits and berries, then stand back and watch the even more colourful parrots enjoying them so much. The munching can be heard from yards away.